For the past 10 years, Rotary Club of Coronado has provided the majority of its funds raised at the Low-Tide Ride & Stride held each year in June to Warrior Foundation — Freedom Station. This February, the club presented a check for $30,000 to the San Diego-based charity founded in 2004 by Navy wife Sandy Lehmkuhler and Retired Navy Cdr. Jim Bedinger and a team of volunteers. Note: Warrior Foundation — Freedom Station is a separate and distinct charity that has absolutely no affiliation with Wounded Warrior Project, a national group that was spotlighted by CBS News earlier this year. Warrior Foundation — Freedom Station assists five groups of warriors: the seriously injured just returning home from war; those suffering from post traumatic stress or traumatic brain injury; those undergoing physical or occupation therapy; warriors who have been medically retired and wish to remain in the San Diego community; and the newest group, “Legacy Warriors” who live in other parts of the country but need to return to San Diego for additional medical treatment. Legacy Warriors will be provided comfortable cottage housing during their stays. The foundation provides a wide range of support, including airfare and hotel rooms for parents coming to their injured children’s bedsides, special sunglasses for those whose retinas detached after IED blasts, modified combat boots for prosthetic limbs, specialized wheelchairs, pillows, blankets and hundreds of plane tickets to send warriors home for Christmas. She said this initial re-entry period is one fraught with fear, uncertainty and self-doubt. “It is during this critical transition that many veterans fall through the cracks and are at risk of joblessness and/or homelessness,” she noted, referencing Vietnam-era veterans that still constitute one of America’s largest homeless populations. To assist warriors in the transition from military to civilian life, Warrior Foundation opened a 12-unit cottage-like housing facility called Freedom Station in May 2011. The key to Freedom Station’s success, Lehmkuhler said, is that residents move in before, not after, they are discharged from the military, thus providing warriors with the necessary acclimation time, guidance and resources to make a successful transition. Residents pay a reduced rent and learn how to manage monthly expenses in preparation for real world living, including college, new careers, and eventual relocation, as well as home-buying assistance. 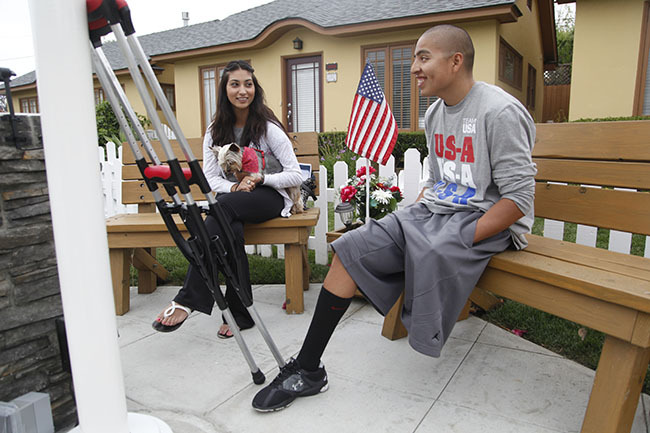 The 12-unit housing complex was selected partly for its location just minutes away from Naval Medical Center San Diego, allowing easier access for medical treatment that is so important to the warriors’ physical and emotional recovery. Warrior Foundation — Freedom Station (warriorfoundation.org) is a 501 (c) 3 nonprofit organization that is operated completely by volunteers and relies entirely on contributions. 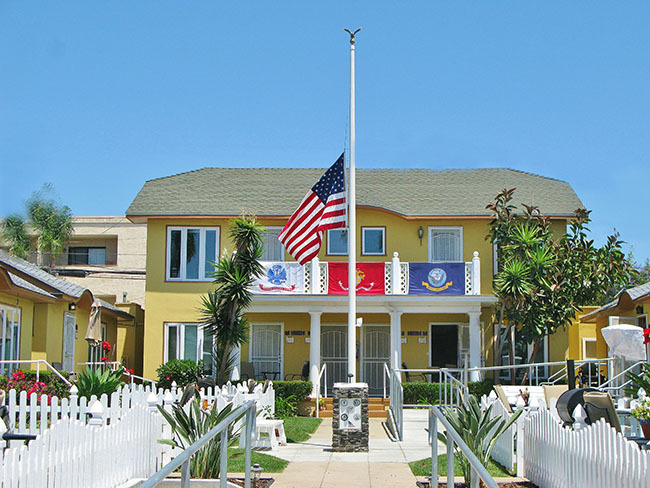 Freedom Station is a 12-unit housing complex on 28th Street in San Diego. Josue Barone takes a break at Freedom Station.